For any Floridian who lived through the 2000 presidential election, the word “recount” may send shivers down your spine. At the time, the presidential race between Texas Gov. George W. Bush and Vice President Al Gore came down to Palm Beach County. Then-Supervisor of Elections Theresa LePore was under fire for her design of what came to be known as the “butterfly ballot,” which left many voters confused and led to overvotes and unintentional votes for the wrong candidate. The visually challenging punch card ballot design turned an estimated 2,800 would-be Al Gore voters into Pat Buchanan voters in Palm Beach County. 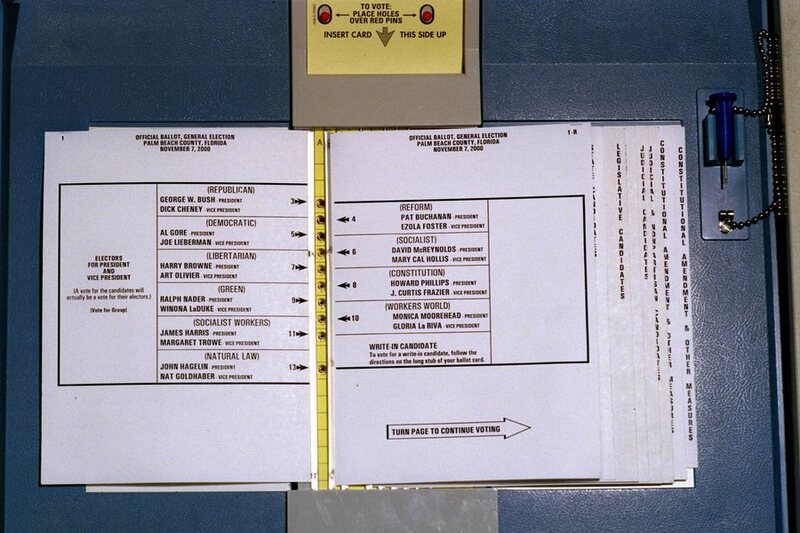 The infamous “butterfly ballot” showing the presidential candidates in Palm Beach County for the 2000 election. And many more voters picked more than one candidate in the crowded 10-candidate presidential field. There were 19,120 of these alone in Palm Beach County, where 23 percent of the ballots cast in Pahokee, Belle Glade and South Bay were invalidated because of it, according to The Palm Beach Post. On top of that, tens of thousands of other voters had cast ballots without registering any vote at all for president. The mess resulted in a 36-day recount battle that resulted in Bush winning Florida, and thus the presidency, by 537 votes out of nearly 6 million cast. In short, Florida’s voting system was exposed as deeply flawed. After Palm Beach County voted to scrap the punch card machines and costly experiments with touch screen machines that ultimately didn’t solve the problems, the legislature and Gov. Charlie Christ mandated that Florida elections be conducted with paper ballots beginning in July 2008. Since then, Florida has extended early voting and created an online voter registration system. But as this week’s election showed, the system is still not without problems. As of 5 p.m. Friday, Palm Beach and Broward counties still have not finished counting votes. Three races, for governor, Senate and commissioner of agriculture are likely headed to recounts . The state will learn Saturday whether there will be recounts in the bitter and tight U.S. Senate race between Republican Gov. Rick Scott and incumbent Democrat Bill Nelson; and in the governor's race between former Republican U.S. Rep. Ron DeSantis and the Democratic mayor of Tallahassee, Andrew Gillum. Both Scott and Nelson sought to get the courts to intervene. Scott said "unethical liberals" were trying to steal the election in Democratic strongholds of Broward and Palm Beach County. He suggested something was awry because vote-counters were taking longer there than in other jurisdictions, and his thin lead has kept narrowing since Election Night. On Friday, he led by 0.21 percentage points, low enough to require a recount. Nelson lawyer Marc Elias said Scott was using his official position to try to influence the election. "He himself said that as ballots are being counted, it is tightening. Then he made some veiled threat or suggestion that he was somehow going to involve law enforcement," Elias said. "This is not a third-world dictatorship. We do not let people seize ballots when they think they're losing." A recount is mandatory if the winning candidate's margin is less than 0.5 percentage points when the first unofficial count is verified Saturday by Florida's secretary of state. And if the margin is less than 0.25 percent, the recount must be done by hand. While the Florida Department of Law Enforcement said there had been no allegations of fraud, Scott asked — but did not order — the agency to investigate the counties' elections departments. A spokeswoman for the agency said there were no credible allegations of fraud, therefore no active investigation. A judge on Friday sided with Scott and ordered Broward County's election supervisor to release the voter information sought by the governor by 7 p.m. on Friday. The ruling came as the Broward Canvassing Board met to review ballots that had been initially deemed ineligible. Lawyers from the campaigns, journalists and citizens crowded into a room to observe the proceedings. Broward County has a troubled election history, Its county's election supervisor, Brenda Snipes, has been at the center of several controversies, including one 2016 case in which her office destroyed physical ballots but kept digital copies. A judge ruled that the law had been violated. In the race for governor, DeSantis was leading by 0.47 percentage points. While that margin, if it holds, would require a recount, DeSantis has mostly stayed out of the fray, saying he was working on plans for taking office in January. Gillum, who had conceded Tuesday night before DeSantis's margin narrowed, now says his campaign is preparing for a recount.